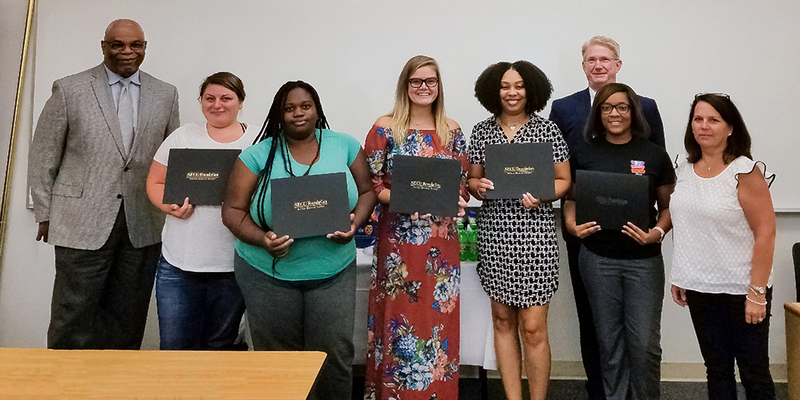 The State Employees Credit Union Foundation recently awarded nine scholarships to Continuing Education students at Edgecombe Community College. Shown from left are Michael Jordan, ECC; scholarship recipients Mary Harris, Zakiya Cofield, Jessica Parker, Tabitha Mack; Doug Spencer (back), SECU; scholarship recipient Briana Sumner; and Cathy Dupree, ECC and SECU board member. Scholarship recipients not shown are Sharon Cannon, Rebekah Hagans, Nour Kasem, and Maya McCray. The State Employees Credit Union Foundation recently awarded nine scholarships to Continuing Education students at Edgecombe Community College. Established in 2013, the SECU Foundation Continuing Education Scholarship Program focuses on assisting the needs of North Carolina’s unemployed and underemployed citizens, military veterans, and members of the state’s National Guard seeking short-term job training for new careers or retraining to advance current job skills. Annually, the SECU Foundation provides a total of 580 scholarships to all 58 community colleges in North Carolina.